They're all mostly hot air is why. The tendency of a graveyard to create more zombies than it has plots, leading to the belief that the hapless heroes have wandered into the Rubber Noses Memorial Cemetery. If it's a spawn point rather than a set number of enemies (inflated though it may be) then the only logical conclusion is that the Cemetery's owner is leasing space to several despots for mass graves. Then again, any movie Zombie Apocalypse worth its braaaains will inevitably have zombies spawn in infinite numbers, so thematically it's dead on. Note that this trope may be justifiable in settings a few centuries before modern times, as mass graves were more common in the past. Where burial space (graves, tombs) is at a premium, bodies may be buried only until they completely skeletonize—then the bones will be removed and stored in an ossuary (hence the Biblical expression "X died and was gathered to his fathers"). The Sedlec Ossuary, in the Czech Republic, is an atypical but striking example of this. Compare Hammerspace, Mook Maker, Clown Car Base. Plan 9 from Outer Space featured a clown car tomb in which Bela Lugosi/Guy Who Replaced Bela Lugosi was interred. Quite a few mourners pour out of the tiny crypt, including, as indicated by the Riff Trax gang, an unintentional cameo by Norm! In Gil's All Fright Diner, the characters notice this and track down the thing that's generating the zombies from out of thin air. Older Than Print: In Dante's Divine Comedy, the Heretics in the Inferno lie in flaming tombs, each of which may contain thousands—in fact, those tombs contain the souls of every single unrepented heretic since the resurrection of Jesus. Episode 11 of Monty Python's Flying Circus shows fourteen (live) men and a dog climbing out of a grave site. The Keep On The Shadowfell adventure for 4th edition Dungeons & Dragons features this in one of its encounters. A 1E compilation pack of one-off set piece encounters justified this trope, as its undead foes weren't actually arising from the spooky graveyard's plots, but from a cursed gate to a Zombie Apocalypse-style world that was built into one of its crypts. In GURPS the Mass Zombie spell raises "(R*R)/2 undead(round down), where R is the radius of the spell in meters" when cast in graveyards. Not sure if that's played straight or an aversion. This comes out to 6.28 square meters per zombie. To put this in another perspective, were the spell cast upon a graveyard the size of Arlington National Cemetery it would produce approximately 402,000 undead. The real Arlington National Cemetery has 300,001 gravesites but also has large memorials and decorative landscaping. Given these numbers, it seems easily feasible that a lower class medieval fantasy graveyard could be as densely packed as the spell claims. Neverwinter Nights had a dungeon with a sarcophagus that will spawn a mummy when an item is removed... or added. Players with characters that were suited to fighting undead could use it to kill a powerful enemy several times over in order to level quickly. That coffin must have had a hidden basement or twenty. Damn those cheap Mulhorandi sarcophagus makers. Earlier in that same area, the graves above the catacombs spawn zombies, so it was possible to get several dozen zombies after you by just running around. Ironically, this sort of thing never seemed to happen at the actual mass graves located in some crypts. 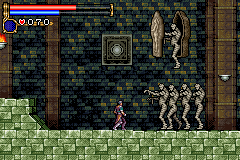 Castlevania: Circle of the Moon, as seen above, has mummies who appear endlessly out of a clearly man-sized sarcophagus; bizarrely, they spawn three at a time. Symphony of the Night has actual zombies who endlessly reform in a beginning area from ooze. The same goes for Aria of Sorrow. Portrait of Ruin averts; the zombies only seem like they endlessly reform. You have to wait until no more zombies spawn to let the Wraith appear. If you want 100% Completion of the bestiary, this is the only way. Occurred in the second stage of Kasandora in ActRaiser, with mummies walking out of the walls every few seconds. The Mummy Sarcophagi in Diablo 2 constantly opens to bring out new Mummies to fight you. The official website says that the Mummy Sarcophagi aren't really used to house Mummies but instead produce soldiers to defend the tombs. The zombies in the same game's second quest spawn like crazy out of a few broken plots. Slightly justified in that there's a mausoleum and a crypt right by the main graveyard itself. Played straight with bottomless spawn points, but averted with PCs/monsters who can raise the dead. There needs to be a body before your necromancer can create a skeleton; and though enemy necromancers can raise the same corpse as many times as you can kill it, they're still limited to the same number of bodies they started with. Hence the usefulness of the Corpse Explosion spell. Diablo 3 has loose stones inside crypts. Sometimes when opening them, you get one skeleton, not unreasonable. Sometimes, lifting a stone around the size of your body, ten skeletons will come boiling out all at once. Funny how the necromancy skill, which raises a percentage of victims in the form of skeletons, worked in Heroes of Might and Magic 4 . Now, the maximum was like 30%, or so, 60% with some items... But, and it's a big but, if you stacked two or three heroes with necromancy, you were able to raise 150% or even 200% of killed creatures as skeletons. Yes, you had more skeletons than dead people. Heroes of Might and Magic V initially had this as well, but the reworked necromancy system averts it, as you can't raise more undeads after fight than there are enemy corpses (that is, if you have the limited power required to raise them all in the first place). Instead, you can also raise higher level undead types depending on the enemy you fought. Then again, the necropolis buildings seem to work as Clowncar Graves considering the considerable amount of undeads you can hire per week. In Might and Magic III, there are coffins said to be far too narrow to hold a human. Yet if you open them three mummies manage to pop out to kill you. In Warcraft III, a necromancer can animate two skeletons from the bones of a single corpse—even the corpse of a small animal like a crab (which logically shouldn't have bones). The Undead also have buildings like graveyards that spawn skeletons and undead units out of nowhere. On that note, graveyards in World of Warcraft tend to be treated in one of two ways: either they're the location of a spirit healer (who resurrects dead players) and therefore safe havens, or they're avoided like the Plague (pun not intended) because they're zombie factories. There are a few dangerous graveyards that have small, safe pockets where you can resurrect. A similar mechanic in Guild Wars is somewhat justified: The "bone minions" created by necromancers are not reanimated corpses, but artificial constructs assembled from the pieces of a corpse, so it's not too implausible that one corpse can provide enough bones and meat for two small minions. But making bone minions from dead jellyfish is definitely cheating. In the tutorial area of the Nightfall campaign, there are Sunspear "volunteers" (corsair prisoners) whose sole reason for existence is to allow you to practice hexing and/or enchantment removal on live targets. You can kill them, and they automatically resurrect after a while. The down time is long enough for you to cast a spell that animates a bone minion from their corpse, who will then kill the unfortunate guy when he pops back up, allowing you to create a new minion, and so forth. With a little healing, you can create a small army of undead from the one guy. There's no point to doing so (aside from practice in maintaining a minion army), as the "volunteer" (and any minions animated from him) is enclosed in a fence, and there's not a whole lot of use for minions in the area anyway. Dark Gauntlet (1985 video game) has spawn points for enemies that look like coffins and graves. The very first stage of Ghosts N Goblins seems to qualify. By extension, I Wanna Be the Guy did this in the stage based on Ghosts 'n' Goblins. And its sequel, Ghouls 'n' Ghosts. The same can be said of the arcade game Legend Of Hero Tonma. The first stage has coffins that endlessly spawn undead. They're vampires rather than zombies, but it's the same principle. The "Ravenholm" level in Half Life 2 features an infinite number of Zombies. Of course, given that Half Life zombies are formed by coupling alien crabs and human heads, this is more a case of Ravenholm having a very large population (and, presumably, getting hit by far more headcrab shells than are seen ingame) rather than a very large graveyard. Ironically, it does have a very large graveyard. In an inversion of most examples, however, headcrab zombies aren't formed from corpses, so the large graveyard has no impact on the number of zombies! Dead Rising has an achievement given for killing a number of zombies equal to the town's population, mentioned in the opening. The zombies continue to spawn even after this achievement is earned. The Legend of Zelda features a six-screen graveyard where you can get multiple Ghinis (one of the series' earliest undead creatures) from touching one grave. At the same time, no less. After a while, the Ghinis stop spawning, but that is more due to hardware limitations than anything else (proven in that you can keep spawning invincible Ghinis after dispatching the leader). And in The Legend of Zelda Links Awakening two screens just keep pouring out zombies ad infinitum, just slightly northeast of the first village. Hyrule Field for young Link in The Legend of Zelda Ocarina of Time. For as long as night lasts, it endlessly spawns Stalchildren, and every time you kill a certain number of them a bigger one spawns. In Arcanum, a sidequest in Ashbury centers around a necromantic artifact under the graveyard that causes the dead to rise. Until you go down and fetch the item, zombies will continuously crawl out of the ground with no apparent upper limit to the number. This makes for wonderful XP spamming. The original arcade game Gauntlet. The monsters spawned fast enough on some levels where, if the player didn't start for (and kill) the monster spawn points immediately upon entering a level, the entire level would be wall-to-wall monsters, making the level Unwinnable on a single coin. The fact that the player's "health" decreased as a factor of both taking damage AND time didn't help, either. Not to mention it gets worse in the 3D installments, especially as in some levels the monster spawning huts' doors clearly lead NOWHERE, yet reinforcements continue to pour through. PlayStation 2 version of Baldur's Gate: Dark Alliance 2 (not to be confused with the RPG-style PC games of the same name). It has a place called the Battle of the Bones. You can't take five steps without waking up a skeleton. Moving to hit him wakes up another one, or two if you're lucky. And there are THREE incredibly long screens of this hell. Bring potions, be they healing or mana. A lot of them. Baldur's Gate 1 had a cave containing 2 flesh golems. If you try to sleep in the cave, 95% of the time, you'll be "Awakened by stomping feet approaching", and discover a golem is attacking. Said golems are extremely easy to kill with summons. All playable undead characters in World of Warcraft rise from the same exact plot of dirt. Then again, it has been indicated that the Forsaken are collecting potential recruits and storing them in the crypt to see whether they're friendly or not. How about the Death Knight's "Army of the Dead" spell which lets you summon 9 angry ghouls wherever you stand... even in the middle of an ocean, in the Auction House in Orgrimmar, or in mid-air?! The "Dancing With The Dead" mission in Red Faction 2. In a twist, you take advantage of this in Legacy of Kain: Defiance. While in the previous two games, Raziel returned to the Material Realm through a special portal that let him collect matter, in this game he does it by possessing corpses, and he can keep using the same spot to reconstitute himself indefinitely. This can occur in Left 4 Dead, if the Director gets a little loopy when spawning hordes, since it drops the undead wherever the survivors can't see, without paying much attention to how they could have gotten there. This can (or could at one time) even happen with rooms that have already been investigated. All those zombies must have been hiding behind the toilet. In some cases, there is an attempt to justify this by having a massive pile of bodies (though infected are never seen rising from them; see above about spawning out of sight). The logic won't really hold out if you linger... but lingering isn't the point of the game. Going into noclip mode will reveal several hidden rooms that the survivors cannot possibly get to or even see. They're designed intentionally to try and justify or avert this trope. Unfortunately, the AI director's own programming causes it to select the closest, nonvisible room to spawn the hordes. Since bathrooms and nooks behind crates usually don't have much in the way of useful items (mostly pills when your entire team is stocked up on pills) most players don't check these areas, causing them to be labeled as "nonvisible rooms". The AI director will also actively try to spawn then as close as possible, which of course the bathrooms fulfill better than some nondescript block halfway across the hall. Sometimes, the director can get a little insane by spawning zombies out of thin air if there's no other suitable place for the zombies to appear from. Resident Evil tends to respawn zombies when returning to new locations. It suggests the new zombies are freshly re-animating or else just now bothering to get up and stalk you. In Zombies Ate My Neighbors, there's an infinite supply of zombies, though fortunately, there seems to be a limit as to how many of them can be on the map at any given time. The same goes for various other monsters in the game. This is a quirk that is exploited in 100% Completion runs to prevent fast-moving enemies from killing the civilians before you can reach them. In the computer strategy game Majesty, graveyards on the map serve as spawn points for zombies and various other undead monsters. Although only a limited number of graves are shown in any given cemetery, graveyards will still continue to spawn monsters until they are destroyed. Nexus War has Nifleheim, an entire Clown Car Grave world. Although they at least always start in actual graveyards, the Onechanbara games feature zombies who will visibly crawl out of the ground even inside buildings, and in one case onboard a moving vehicle. Although it is possible to clear areas of zombies, they will almost always respawn on re-entering an area, and in some instances will spawn infinitely until a particular zombie is killed. Remarkably, after three games of not giving a damn that all of this makes no sense at all, the fourth title in the series attempts to lampshade it by revealing the zombies are not actual corpses, but creatures spontaneously generated by the Earth itself. In King's Quest IV not only was it instant death if you walked in there without the scarab, but there were way more zombies than graves. The whole mess got Lampshaded during the fan remake of King's Quest II. In StarCraft 2, Meinhoff has that problem. Initially, it makes sense: A refugee camp-turned city will have a lot of people. Hence the waves and waves and waves of infested terrans are understandable. But when there are a few buildings left and they still spawn hundreds of infested terrans every night...well things get a bit odd. Oh, Plants vs. Zombies, how I love thee... what with your virtually endless supply of zombies that can be beaten by peashooters, Snow peas, and the like, you provide hours of entertainment for those of us with nothing better to do. Also, tombstones regularly pop up in the player's backyard (sometimes behind your own lines of defense) during nighttime levels. Actually, this is mostly subverted. Each grave only spawns one zombie, at the end of a level on the final wave. It's played completely straight in "Whack a Zombie", where each gravestone can spawn lots of zombies. Wild Pokémon battles can only be triggered in patches of tall grass, in caves, or in the water. It's pretty believable that there'd be a ton of bats in a cave or jellyfish in the sea, but it's a bit hard to believe there are several dozen animals living in a 5x5 section of grass (especially when the animals in question are fairly large). If you see a grave in Champions Online chances are it will spawn undead enemies when certain missions or events are taking place. Needless to say if you hang around any graveyard long enough, you can see an endless number of enemies emerge from any given grave. City of Heroes has Dark Astoria, which originally was a section of the city with a large graveyard as its defining feature. Now, it's overrun with undead, and always will be, no matter how many die. "The Zombie Island of Dr. Ned" DLC for Borderlands, despite being a logging camp that looks like it could only hold a few hundred workers has a hundreds of thousands of zombies that just keep crawling out of the swamps. Somewhat averted with Dead Haven, as a good deal of corpses were already there (back when it was Old Haven), especially after you tore through there in the main story. In Dragon Slayer, tombstones functioned as Mook Makers. Clive Barker's Undying had a spell where you yanked skulls out of the ground and fired them like a rocket launcher. The manual explained that the area you were in had been a battleground for centuries, and there basically was not one square inch that something hadn't died on. Drakensang: In the swamps of Moorbridge you find an evil necromancer who has enchanted the local tombs, so that they now spawn zombies to no end. The Lychfield Graveyard in Fable I spawns legions of Undead as you tramp around it. In Final Fantasy XII-2, C'ieth spawn constantly in Academia 400 AF, everywhere in the city, sometimes seconds after you've already killed the last group. Justified in a deeply disturbing way, the city's entire population (which is probably millions) is being slowly transformed into C'ieth, one by one. One level of Quake has a zombie-generating graveyard. This page was last edited on 9 April 2017, at 20:39.